I envy you Italians for your beautiful country, your excellent football tournaments, and most of all, your amazing cuisine. As I am the biggest fan of the world’s greatest football club Juventus, you might assume that I dislike supporters of other teams, but I actually enjoy staying in touch with all Italian fans around here, so I invited a fan of the club AS Roma for lunch to have the favorite meal of Italian fans: pasta! 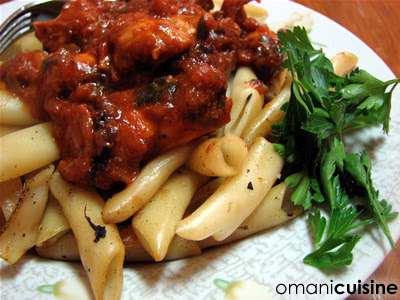 As a token of my Italian love, I named this recipe “Pollo Della Pasta De Roma” or the chicken pasta of Roma in English. Boil water in a pot. When the water starts boiling add salt, pepper and oil while stirring. Add the pasta to the boiling water and keep for about 10 minutes. Chop 3/4 of the 4 kinds of capsicum and an onion into small short strips. Fry the capsicum and the onion in on an oiled frying pan until the onion turns yellow and capsicum softens. Add the pasta to the pan with capsicum and onion while stirring. Add some of the Nandoâ€™s crushed spices while stirring. Stir the pasta mix for five minutes and then serve it with the chicken. Crush the remaining capsicum and the2 onions into fine little. Put some oil on a hot cooking pot, add some butter. When the butter melts in the oil add the crushed mix of capsicum and onion. Keep stirring the mix until the onion turns to a golden color. Add the chicken pieces to the mix and stir the mix until the chicken turns white. Add salt, pepper, and the Nandoâ€™s crushed spices. Keep stirring for a couple of minutes. Add the Nandoâ€™s wild herb sauce and some fine chopped parsley. Keep stirring for another couple of minutes. Add the tomato paste and the wheat while stirring. After mixing everything together add a mug of water and stir the mix well. Cover the pot well and keep it on a low heat until the chicken is cooked. If all the water is gone and the chicken is not cooked add little more water and wait until it is cooked.